Piers Morgan has given up his seat on the Britain’s Got Talent judging panel in order to fill the nightly interview seat held by Larry King on CNN for 25 years, but will remain on America’s Got Talent as a judge. King’s last show is set to air on December 16th. Speaking to Forbes.com, King said that, although he’s had Morgan on his show a couple of times, he knows virtually nothing about him. While King’s choice for his replacement would have been Ryan Seacrest, King did say about Morgan, “I like him very much. I wish him nothing but the best – he’s going to guest on my show in October. I want him to do well. It’s funny, my wife met him before I did, at a Dodger game.” King’s final guest will be former NY Governor Mario Cuomo, who was King’s first guest when the show began. Morgan has reportedly also signed a new two-year deal with ITV. 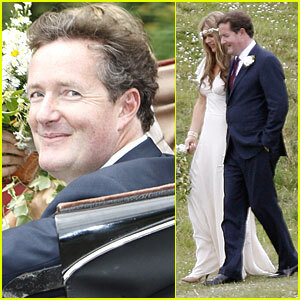 The Sun claims that the contract, said to be worth £2.6m, will cover 12 new episodes of Piers Morgan’s Life Stories. 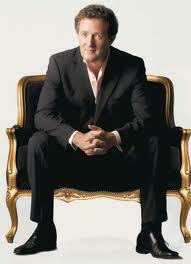 Before breaking into British television, Morgan was the editor of a tabloid, the Daily Mirror. He was fired after the newspaper published fraudulent photos of British soldiers abusing Iraqi prisoners. 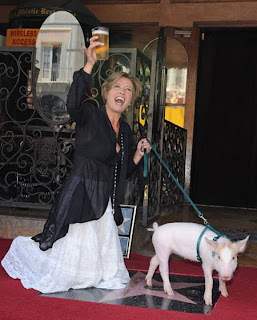 and showed up at the unveiling with a pig and a pint. So, does this mean that Emma’s version of My Fair Lady will be more like dark molasses than white sugar? In the end, will Colin Firth actually play Henry Higgins? 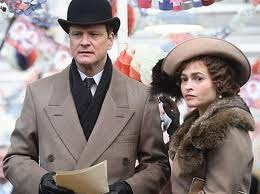 We’ll have to wait and see, but in the meantime, as Victoria let us know in yesterday’s post, it’s dead cert that Firth will be playing King George VI in The King’s Speech. Set to open in November, Geoffrey Rush plays royal speech therapist Lionel Logue, who worked to help George VI overcome his stammer. Helena Bonham Carter will play the Queen Mum (!?). And he keeps it … ah … out of sight. So there’s nevah, nevah a trace of red. Lies a body just oozin’ life … eeek! Could that someone be Mack the Knife? Don’t you love Mack the Knife? I do. I’ve added Bobby Darin’s version of the song to nearly every cd I’ve burned. Imagine my surprise when I learned that Mack the Knife has it’s roots in England . . . . . The character of Macheath, later to become Mack the Knife, first appeared in The Beggar’s Opera by John Gay (1685-1732). 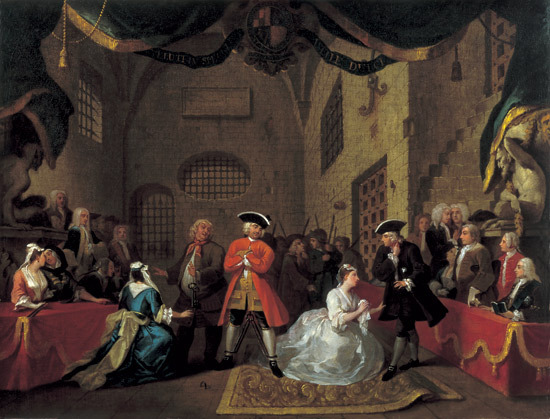 The Beggar’s Opera, a comic ballad opera, took London by storm with it’s portrayal of the lower-class criminals satirizing the government and upper-class society. The main character of The Beggar’s Opera is a swashbuckling thief called Macheath who is polite to the people he robs, shuns violence, and shows impeccable good manners while cheating on his wife. The character is usually understood as partly a satire of Sir Robert Walpole, a leading British politician of the time. The Beggar’s Opera was a success from its first production in 1728, and continued to be performed for many years. It was the first musical play produced in colonial New York and legend has it that George Washington enjoyed it very much. But back to the song . . . . . the much covered popular tune (Armstrong, Fitzgerald, Darin, Sinatra, Buble, et al) was composed by Kurt Weill with lyrics by Bertolt Brecht for their music drama Die Dreigroschenoper, or, as it is known in English, The Threepenny Opera – based on The Beggar’s Opera. It premiered in Berlin in 1928 and the song became a popular standard. “Mack the Knife” was introduced to the United States hit parade by Louis Armstrong in 1956, but the song is most closely associated with Bobby Darin, who recorded the song in 1958 and won Record of the Year in 1959. Kurt Weill’s widow, Lotte Lenya, was the star of both the original 1928 German production and the 1954 Blitzstein Broadway version and she happened to be present in the studio during Armstrong’s recording. He spontaneously added her name to the lyrics, which already named several of Macheath’s female victims. All the other women’s names, Suky Tawdry, Jenny Diver, Lucy Brown, etc., appear in the original German version. You can watch a classic video of Bobby Darin singing Mack The Knife here. It is a little known fact that, had it been up to King William IV, the Duke of Wellington would have been appointed Regent in the event that William died before the heir to the throne, Princess Victoria, reached her majority. In theory, Wellington could have acted in the capacity of King until Victoria became eighteen. However, there were some in the government who felt that the Duke of Wellington had more than enough power already, thank you very much. And besides, the Duchess of Kent was jockeying for the position of Regent, with her brother, Prince Leopold supporting her so that he could be the power behind any Regency that might come to pass. The Royal Princes, the King’s brothers, were also opposed to Wellington, but the point was ultimately settled by the Regency Act of 1830, which stated that the Duchess of Kent (at right) should be her daughter’s guardian and act as Regent during her minority. No doubt chortling with glee, the Duchess made the first false move in her relations with William IV immediately following the death of George IV. She was too anxious for recognition, too eager to secure what she thought was due to her, and she did not give the new King the chance of showing his appreciation of her change of circumstances. She wrote instead to the Duke of Wellington, then Prime Minister, asking that a suitable income should be bestowed upon herself and her daughter, over which allowance she should have full control, and that the Princess should be put on the footing of Heir-Apparent. To the demands of the Duchess, the Duke of Wellington replied that nothing could even be proposed for her until the Civil List was settled, but that nothing should be considered without her knowledge. This reply is said to have much offended the Duchess, and for a long time she ignored the gallant old man when she met him. To tell the Duke of Wellington that you doubted his veracity and the likelihood of his relating the message from William IV exactly as William IV had delivered it, and to request that the King put his words in writing, rather than trust them to Wellington’s mouth, was a gross insult upon both the King and Wellington. No one else would dared to have spoken to the Duke in such a manner, much less to imply that he would act less than honourably. Had she sent her general adviser, Sir John Conroy, to negotiate with the Duke, or had she invited the latter to Claremont, she would have kept within the limits of politeness; as it was, the only thing left for the Duke to do was to send the Bill to her to study, as he could not in writing give all the explanations he had intended. In the meanwhile Lord Lyndhurst had brought up the measure in the House of Lords, and the Duchess of Kent had sent Conroy up to hear him. 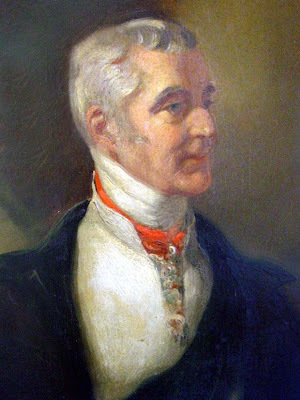 A Regency Bill was introduced by Lord Lyndhurst, but a change of Government occurring before it was carried, it devolved upon Lord Brougham, the Lord Chancellor in Lord Grey’s Administration, to take up and adopt the measure. The position was a singular one, because Parliament had to contemplate the possibility that William IV might die leaving a posthumous child. Lord Brougham could not find a parallel case in English history since the death of Geoffrey, son of Henry II, who left a son, Prince Arthur, whose claims were thrust aside by the usurpation of King John. The possibility of posthumous issue in William’s case having been provided for, the Bill passed both Houses and became law. The Duchess of Kent was named guardian of the infant Princess and regent of the kingdom, but she was to be assisted by a Council of Regency drawn from the royal family and the Ministers of State. Some months afterwards further provision was made for the education and maintenance of the Princess, and for the support of her honour and dignity as heiress presumptive. A sum of £10,000 a year was voted, in addition to the original annual grant of £6,000. The Princess Victoria’s first appearance at Court during the new reign was made at the celebration of Queen Adelaide’s birthday, on the 24th of February 1831. The drawing-room held by her Majesty was stated to have been the most magnificent witnessed since that which signalized the presentation of the Princess Charlotte of Wales on the occasion of her marriage. 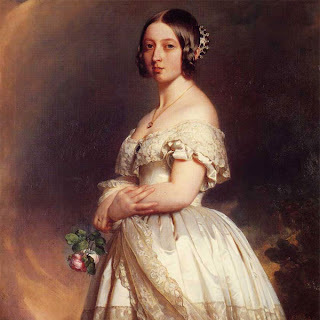 The Princess Victoria stood on Queen Adelaide’s left hand. Her dress was made entirely of articles manufactured in the United Kingdom. She wore a frock of English blonde over white satin, a pearl necklace, and a rich diamond agrafe fastened the Madonna braids of her fair hair at the back of her head. She was the object of interest and admiration on the part of all assembled. The scene was one of the most splendid ever remembered, and the future Queen of England contemplated all that passed with much dignity, but with evident enjoyment. the royal State procession. The people cheered the Queen lustily, but, forgetting herself, that gracious lady took the young Princess Victoria by the hand, led her to the front of the balcony, and introduced her to the happy and loyal multitude. 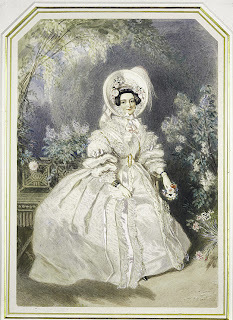 In January 1831 the Princess made her first appearance at the theatre, visiting Covent Garden, and thoroughly entering into the pleasures of the children’s entertainment provided. All was fine for a time . . . Until the Duchess of Kent began to put her daughter forward as all but England’s Queen – before the present King had died. See our past post to learn how the relationship between the Duchess of Kent and King William IV – and Wellington – further fell apart. Do You Know About Dr. Finlay? 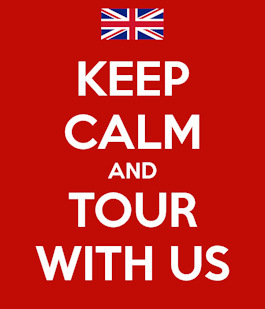 Yes, yet another medical based British telly series to tell you about. Based on a novella entitled Country Doctor by author and doctor A.J. Cronin, Dr. Finlay’s Casebook was a television series that was broadcast on the BBC from 1962 until 1971. The storylines centred on a general medical practice in the fictional Scottish town of Tannochbrae during the late 1920s. The latest television series featuring Dr. Finlay is set in the post-WWII era, with the plot lines revolving around a small local medical practice in Scotland. 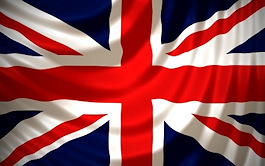 One of the recurring themes is the transition to the National Health Service, instituted in Britain in 1948. Doctor Finlay supports the move, while other doctors resist the change. 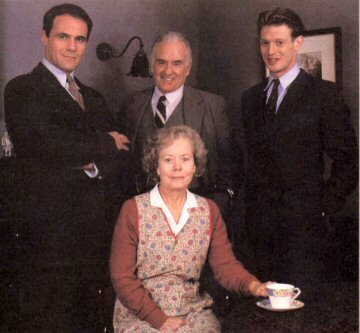 The show stars David Rintoul as Dr. Finlay, Ian Bannen as his semi-retired practice partner, Dr. Cameron, and Annette Crosbie as his housekeeper, Janet. Other central characters include Finlay’s assistant, Dr. Neil, played by Jason Flemyng and Finlay’s new partner, Dr. Napier, played by Jessica Turner. The series is a Scottish Television production (now known as STV Productions) that was filmed in Auchtermuchty, Fife, Scotland. It aired in the U.S. on PBS’ Masterpiece Theatre. Life in post-war Scotland–or to be precise, post-war Tannochbrae–is not getting any easier for Dr. John Finlay. His workload is increasing now that former partner Dr. Cameron is semi-retired, his relationship with young Dr. Neil is strained, and he is also preparing the practice for the setting up of the National Health Service. Meanwhile the ever-reliable housekeeper Janet is preparing for her marriage to local pharmacist Angus Livingstone, though she is worried about her successor at Arden House. The interactions between three generations of doctors adds extra depth and interest to the stories. Each fellow has his own quirks and weaknesses. We like them all, even when they are cantankerous (Cameron), humorless (Finlay), or cocky (Neil). 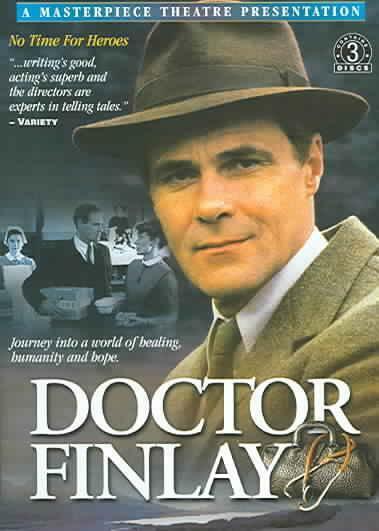 A look at the plot synopsis for the first episode, which aired on 9 May 1993, will give you the flavor of this character driven series: In 1946, Dr. John Finlay is finally demobilized and he returns to life in private practice in his native Scotland. His partner, Dr. Alexander Cameron, has stayed on passed his retirement age to keep the practice open pending his return but it is now far less prosperous that when he left it and is barely paying for itself. Dr. Cameron hires a new locum, Dr. David Neil, to join the practice but fails to consult Finlay before doing so. Finlay and Neil begin to question the elder member of the practice’s judgment when they suspect he had mis-prescribed medication to a pregnant woman. For the remainder of the series, the private lives of the characters and concerns of the patients drive the plots and often tug at the heartstrings. Settle in with a cuppa and enjoy these dvds, which should be available through most public libraries. Author Kristine HughesPosted on September 4, 2010 Categories Do You Know About?, Kristine Hughes, Uncategorized2 Comments on Do You Know About Dr. Finlay? Available in print and e-book – free with Kindle Unlimited! 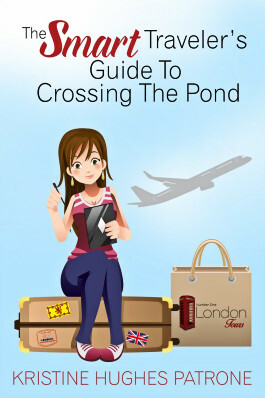 ©2019 Number One London Blog. All Rights Reserved.